As you can see below there is a full definition of the term Rodentia, if you are interested, like me, then once you have read the preamble you can click on one of the links above to take you to the page which most concerns you. Also included above are some none-rodent types, which , thanks to do-gooders releasing them, various imports and escapes, have become a major problem to indigenous species e.g. Mink...! The rodents, or Rodentia, are the most abundant order of mammals. At present, over a quarter of the families, 35 percent of the genera, and 50 percent of the species of living mammals are rodents. Probably an even higher percentage of individuals are rodents, for they tend to be small animals with dense populations. They are one of the few groups of animals that flourish in close association with men. Some, such as squirrels, live independently but fairly successfully near humans. Others, such as the house mouse (Mus musculus) and black and Norway rats (Rattus rattus and R. norvegicus), have adapted themselves to human civilization, and live everywhere that man does. 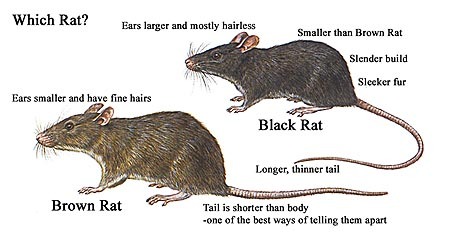 These two rats (and the Polynesian rat, Rattus exulans, of Australia and Oceania) have travelled in ships and boats of all sizes, and have populated the entire habitable world, especially near human habitations (see below for differences). GENERAL FEATURES: All rodents possess one pair of upper and one of lower incisors, growing throughout life, with the enamel restricted to a band on the front side of the teeth. Behind this is a large gap (diastema) followed by two to five cheek teeth. The jaw articulation is so arranged that when the cheek teeth are in use, the incisors do not meet, and vice versa. The incisors grow continuously, and must be worn off equally fast, or the whole gnawing mechanism is ruined. Because of the necessity to abrade these incisors, rodents spend a considerable amount of time gnawing hard objects. Generally rodents are small. Some mice and dormice are among the smallest of living mammals, adults being as small as 75 millimetres (three inches) long, including the tail, and weighing as little as 20 grams (0.7 ounce). The largest living rodent is the South American capybara (Hydrochoerus hydrochoeris), reaching over 1.3 metres (four feet) in length and as much as 50 kilograms (about 110 pounds) in weight. A fossil rodent recently described from Uruguay is reported to have had a skull as large as that of a bull and a body bulk as large as that of a wild boar. Rodents are of major economic importance, primarily as consumers of the grains that are the basic foodstuff for man. It has been estimated that rats and mice destroy up to one-third of grain crops under conditions of heavy infestation. Burrowing rodents may damage root crops. The muskrat (Ondatra zibethica) and nutria (Myocastor coypus), introduced into Europe as fur sources, have escaped and spread over much of Europe between the Baltic and the Alps. Their burrows, particularly in canal banks, have been a major source of damage to the drainage system, most especially in The Netherlands. A number of rodents serve as reservoirs for human diseases, such as bubonic plague, tularemia, scrub typhus, and others. The plague that ravaged Europe during the mid-14th century was transmitted by fleas from rats to humans. Several rodents (beaver, muskrat, chinchilla, nutria, squirrel) produce fur useful to man. All but beaver and squirrel have been domesticated for this purpose. Albino mice and rats, hamsters, and guinea pigs are widely used as laboratory animals for biological and medical purposes. Guinea pigs were domesticated by the Incas for food; a few kinds of rodent have been raised as pets. Rodents occur naturally in all parts of the land where there is an adequate food supply and are found in essentially all terrestrial habitats. They range from well above the Arctic Circle to the southern tips of Africa and South America and were the only terrestrial placental mammals, other than bats, to reach Australia before the arrival of man. Many rodents have successfully adapted to difficult environments such as deserts. Many rodents have broad climatic tolerances, an example being the North American porcupine, which is found from the Arctic Circle to central Mexico and from the Atlantic to the Pacific. Most are quadrupedal scamperers, but they generally have much freedom of use of their forefeet in manipulating food; many are burrowers, spending most of their life underground; some are ricochetal, leaping on their hind legs; flying squirrels use skin membranes to glide from one tree to another; a few (beaver, muskrat, water vole, nutria) have become amphibious in habit, living in freshwater streams and ponds; and a number of South American rodents are cursorial (running) animals.